It's been over 5 years since our family decided to pursue a service project in a Third-World country before the children start leaving home. Through friend-of-a-friend connections we ended up going to Kenya four years ago to help in a home for 25 orphaned street boys, "Into Africa," run by Rick and Audrey McAninch. As you probably know, we ended up adopting the youngest of the boys, Steven. Among the many coincidences/miracles of his adoption story was the fact that we fell in love with him before we knew that he was the only one of the boys who had no known or traceable relatives. Everyone else had a grandma back in the village, or an uncle somewhere that could no longer take care of them. Steven had absolutely no one. We've been thinking it's time we visit Kenya again, now that Steven knows he's part of our family for real and hopefully wouldn't have too many identity issues (a few are inevitable) going back to the orphanage. We decided to invite the other two high school seniors along (Emily is the third) for their required-for-graduation mission trip. And in early December we bought our tickets for a trip in April. And at the end of December everything blew up in Kenya after the corrupted elections. So we have been around and around the mulberry bush, trying to decide what to do. Not only is our trip up in the air, but also a substantial outlay of nonrefundable dollars. So, do we postpone the trip, cancel it altogether, go to another country instead, and if so, where? Yesterday the two rival candidates in Kenya signed a power-sharing agreement that offers a tenuous, tentative, fragile hope for peace. And if it all works, the long process of rebuilding lives, businesses, society, and structures begins. If not--that prospect is terrible to think about. In the grand scheme of things, our plans and tickets are a small loss. But we hope this means we will be able to travel as planned. poor phone service in her area. Please pray for Veronica." Some time ago, in a burst of domestic ambition and probably a high fever, I read a Martha Stewart book on decorating your house. I learned that you should have green steel science-lab cabinets in the kitchen, and it's ok to spend all summer travelling across the country collecting antique glassware at flea markets, and you don't need curtains, and a few glass bottles on the windowsill are all the decor you need in the bedroom, but in the kitchen you need custom-built shelves in every corner and on every vertical surface for all that glassware you bought on your summer travels. I kid you not. Anyway. I remember that Martha said that you shouldn't just pick a random color of paint for your walls. The colors need to be subtle, and blended, and have many different layered tones in a single color of paint. It seems the Martha Stewart brand of paint was best for all this, strangely enough. We came back from Florida last week to find that Steven's 8 chickens had all of a sudden started laying like crazy. I get such a rush out of those eggs. Besides the fact that they make the most delicious breakfast you ever ate, they are just so pretty. I think the subtle colors and blended tones have Martha Stewart and her paint beat all to shreds. "Jenny, don't barf in that bucket! There's headphones in there!" All the cool young people are doing these quizzes so I made one too. You can take mine here. As you can see, when you're a mom you try to make questions about yourself but pretty soon they're all about your family. My family will be happy to inform you that there are a few things that I am really obsessive about, and one of them is wastefulness, especially wasting food. Is it because I grew up poor, with Depression-era parents? Or because I know what it's like to feed a family on very limited finances? Or because I've been in a few poor countries? Or because I know my own son was so hungry at one point that he would root through garbage or go eat raw corn off the ears in the neighbor's cornfield? Probably all of the above. It really really bothers me when food is wasted. Like the time we went to a banquet fundraiser to help the Eugene Mission feed the hungry, and were served more food than any temperate person could possibly eat, and many many pieces of baked chicken and delicious carrot cake got sent to the trash. . .and I think the irony of this escaped everyone but me. I make the kids clean their plates even though the experts say it will warp their personalities--(easy solution here: teach them to take small portions). And I am the queen of using up leftovers creatively and of feeding to the chickens what the humans in the house won't eat any more. So the other day I was at Grocery Outlet piling my stuff on the counter when I heard the clerks talking among themselves. "I'm taking two." "Have him save one for me." The clerk saw my curious look and explained, "We got a load of eggs in but they're one day outdated, so we have to throw them out. But I'm going to take a few cases home." "One day outdated and you can't sell them?" I said. "But couldn't you give them to the Eugene Mission?" "They don't take anything outdated." Obviously I understand this policy--salmonella and lawsuits and all. But has common sense completely deserted us? We all know those eggs had been refrigerated up until the last ten minutes or so, and it was a cold day. From all the United Way campaigns we know there are lots of hungry children right here in Eugene, and hundreds of homeless folks besides. And we toss hundreds of perfectly good eggs into the trash. I think that's terrible. Or am I just being obsessive? "I went to the humidity of staying home." --Steven, fussing that I made him skip school when he wasn't that sick. I think he meant "humility." Legal disclaimer: Personal observations only. Generalized conclusions. Any resemblance to actual persons living or dead is purely coincidental. Research not conducted by accredited firm. +/- 50% margin of error. May reduce your cholesterol up to 4% if eaten as part of a low-fat diet and consistent exercise program. Consult physician or medical care provider. No refunds. So I’ve posted about the car, the flights, the Amish, and the phone calls, but not much about the conference itself. What I liked about the conference was that it was designed to encourage. The special ladies-only times made us feel cared for, and the afternoon tea was lovely, and the skits were funny but thought-provoking. It was fun to connect with old friends, and most of the speakers at the whole-group sessions were really good and I learned a lot. However. This is the tough thing about a conference such as this: it highlights all my misgivings about being a minister’s wife. Don’t get me wrong. I love being Paul’s wife. And I really like hearing him preach, and I think he is excellent at what he does. And it's not that people at our church aren't supportive and wonderful. But the honest truth is that I have issues with the whole Minister's Wife aura and vague undefined expectations that I always sense I am not living up to. If I were choosing ministers wives I would pick someone who first of all is calm and good, and isn’t worried about what people think, but I guess God disregarded that memo in my case. It’s not that I hate being a minister's wife, constantly chafing at the bit. I see it kind of like asthma, a burden to bear, a source of suffering that God put into my life for some reason I’ve never understood. I think I’ve accepted it, and I’m sure it has a purpose. But I can’t say I like it. I don’t fit the mold. I talk and laugh too much, and I don’t shut up when I should, and I’m either too honest or not honest enough. I don’t pray enough, and I don’t sound deep and spiritual, and I am terrible at confronting people. Oh, and I don’t like going visiting, and I like to imitate weird preachers, and it just kills me to keep secrets. And I can't sing. During the icebreaker times at the conference I was chagrined at how many women said they enjoy cooking, baking, and having guests in for meals. I enjoy all of these on occasion, but I’m always relieved when I don’t have to do them, with the exception of my children bringing home their friends on Sunday afternoons. But I completely stress out about having a tableful of "real" company for Sunday dinner. Also, ministers’ wives are supposed to be good, and I frankly am a sinner and if God didn’t keep me saved by his grace and mercy I would be hopelessly out on my ear. As you can see, I’ve been way too honest here, which proves my point I think. "Well, see, I just like to cry. I just enjoy it. I like to listen to funeral songs and stuff. I would make a good charismatic." I have always known that Sarasota/Pinecraft, Florida was a winter haven for Amish and Mennonites. My very tan cousin Norm lived there for years, my friend Cathy spent a few winters there, Aunt Vina goes now and then, and Mom even went down one winter in the 1940’s, before she was married, and told us stories later of how she was cleaning a hotel room one day and a shell-shocked soldier wandered in and scared her half to death, and the time she sat in the back of the bus with the black folks because that’s where the empty seat was, and when the driver noticed her, he stopped the bus and went back and told her she has to sit in the front. I have also always known that Florida was where the wild Amish young people go to have a good time. My friend Cathy said you could always spot them a mile away. When she was a waitress she’d see these groups of young men trying to look all Englisch in t-shirts and cool haircuts, and she’d nonchalantly start talking Pa. Dutch to them. What I didn’t know was that Pinecraft is basically a little relaxed Amish/Mennonite enclave of modest houses and bikes and foot traffic and little ice cream shops and fruit stands at the edge of a very large and bustling Sarasota with high-rise hotels and lots of shiny expensive cars. Palm Grove Mennonite Church, where the ministers’ meetings were held, is right at the edge of Pinecraft, and the place we stayed is not far away. So I had opportunities—but not as many as I wanted—to taste of the local flavor and observe the culture. And one word keeps popping into my head: incongruous. Honestly, it felt like your mind got a little twist every time you went down the street. The first day, I gaped out the car window and burst into giggles as we passed an Amish woman in a nice Amish head covering and dress. . .with no socks. . .and Crocs! Then there was the group of Amish girls. All had Amish dresses on, in varying degrees of adhering to the Odning*, but the headwear ranged from a regular Amish cap to very-trimmed ponytails. Most of the Pinecraft locals ride either bicycles or those three-wheeled bikes—I don’t know if they call them tricycles or what. 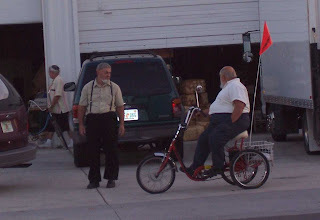 After becoming accustomed to sleek lycra-ed, helmeted bikers around Eugene, it was quite a sight to see Amish folks of every shape and size riding around town, such as the lady who must have weighed 250 pounds and bulged all over the place. I guess she needed the exercise. But I have to say the Mennonite ladies on their bikes gave me the worst turn of all. You have to understand here that if you grow up Amish or Mennonite, it’s assumed you will always wear dresses or skirts, and beyond that the #1 rule for how you appear in public, the Magna Carta, the Preamble to the Constitution, the eleventh commandment, pounded into your head by your determined mother, is KEEP YOUR KNEES COVERED. So I was surprised to pass a garage sale and see a Mennonite girl out front who stopped by on her bike. She had her hair up and wore a bitty lacy covering and a summery dress, and the dress was pulled up to thigh level as she straddled her bike. Ooooo-kaaaay. Well maybe she’s just young and a bit foolish. Then I saw the same thing again. And again. The crowning touch was when a bunch of us ladies were standing outside after our afternoon tea and a Mennonite couple came riding down the sidewalk. Mr. came first, with a button-down shirt and black pants and a trimmed gray beard. Behind him came his middle-aged wife, with her hair in a bun and a little doily covering and a tight gray dress. . .that was yanked way way up on her lovely bare thighs as she rode breezily along. Starla Schlabach from Pennsylvania turned to me and said, "That. Is. SHOCKING." I guess to me the most incomprehensible thing about this was that these ladies apparently feel that they are properly attired because they’re wearing dresses instead of pants, as they were always taught, and are completely oblivious to the painful perspective of folks in oncoming traffic. I think this qualifies as a case of tradition staying on and the principle getting utterly lost. I also assume the middle-aged lady in particular didn’t have a mom like mine. Believe me. I should add that the Amish ladies in their full-skirted dresses have no trouble keeping their knees covered on bikes. And I have to wonder uncomfortably—what similar inconsistencies are there in my life that I am completely oblivious to? And are my daughters getting the foundation principles of modesty/femininity or only the applications? Yikes. "I put on my headphones and turned the volume all the way down." With our 3-hour delay in Las Vegas we got to Tampa after 3 in the morning. It was Valentine's Day, and we had reserved a room at a really nice hotel (through Priceline, as a good Mennonite minister ought, getting a $300 room for something like $65), so of course we had been expecting a Wonderful Romantic Getaway despite the fact that our purpose for going was actually a ministers' convention, which by definition isn't especially romantic. So we got our luggage and shlepped it down passageways and around corners and up ramps to the Budget car rental place. After a long wait we were finally informed that the attendant was gone for the night and we had to go to another place on the other side of the airport. So we retraced our steps plus a bunch extra, and found the right place. Of course Paul as a good Mennonite minister had reserved an economy car. However, those were all taken, so we had three choices, all for the same price as an economy car: a sedate minivan, a kind-of-sedate SUV, or a Mitsubishi Spyder convertible. Now this is a terrible moral dilemma for a Mennonite minister--like free beer, as the old joke goes--two much-too-large gas guzzlers vs. a worldly hot rod. Stewardship and gas mileage won out, and we got into the convertible, which was like getting into a kayak, and took off to find our hotel, using the map Paul had printed off Mapquest. But we might as well have had a map of Boston for all the good it did us. Almost nothing matched up--names, numbers, nothing--and we went around and around through lots of road construction and got very confused and I must say crabby, as morning was rapidly approaching. Paul finally got the right Hyatt on the phone--the third try--and the nice lady talked us in, and by this time it was after 5 a.m. and the less I say about our state of mind and body, the better. The nice lady told us we can stay til 2 pm instead of the normal 11 am checkout, and we collapsed into bed and woke up many hours later to brilliant sunshine peeking around the drapes, and I made coffee in the adorable little machine, and all was well, and later we headed leisurely down to Sarasota, and Paul was a romantic husband and stopped so we could take a walk on the beach. Me: Maybe people will think that you're really rich and I'm your trophy wife. Paul: You're my trophy wife whether people think so or not. "I am not an expert at stuck pigtail holders." So there I was, sitting almost halfway forward in an evening service at a very packed Palm Grove Mennonite Church, toward the end of an intense sermon, and my phone rang. Thankfully I had it on 'vibrate.' I pulled it out of my purse and checked who was calling. "Home." Now there is something about getting a call from home when you're clear across the country that coughs up visions in your mind of broken legs and vomiting children and dogs hit by cars and maybe even kidnappings. So I prepared to quickly exit. However. The benches at Palm Grove have about as much legroom as coach seats on an airplane. To my right were six adults. To my left were two, and the one closest to me was Ludlow Walker, a large black guy from south Florida who had only an inch or two to spare in front of his knees. I'd have to wait. The phone quieted but then a few minutes later it buzzed again. Surely a car accident, or maybe the house was on fire. What should I do? It would cause a huge commotion to get up and worm my way out. "Hey Mom, when you're making spaghetti, do you let the water boil before you put the spaghetti in?" My rather long absence here has a simple and wonderful explanation: I was in Florida, with the tiniest vestige of a leftover sunburn to prove it. It all began when Arlen the other pastor urged Paul to go to the BMA (Biblical Mennonite Alliance) Ministers Enrichment Week in Sarasota, Florida. Paul said he's not going unless I can go too, and I had a scheduling conflict. But the nice organizer lady at First Baptist switched me with the March speaker, and that was that. I understand there are people who can just up and go to things like this. We, in contrast, had to find someone to teach school for Paul (nephew Randy), stay with the children from Wednesday to Friday (also Randy), keep the kids for the weekend, (Clugstons, Doutrichs, Ruckerts), and bring them all home Sunday evening and stay till we arrived (Grandma). Then there were the little details of making sure the animals were cared for and suppers were planned and well, if you are a parent you know all this and the rest of you probably can't comprehend anyway. Meanwhile, in an exciting twist in the plot, Emily left the same day we did to go spend two weeks with Amy in South Carolina. A few weeks ago, in an attempt to give our very lethargic and discouraged Emily some incentive to eat and drink and take her vitamins and do her schoolwork, Paul said if she keeps this long list of requirements for two weeks she can go see Amy. Well, did that turn things around fast. So I took her to her gate at the Portland airport on Wednesday before Paul and I left for Florida. She was a rather striking picture, with her elegant black coat and pink and green striped skirt and interesting socks (one pink, one green)(which looked cooler than it sounds) and of course "John McCane," her black cane decorated with a pink ribbon and princessy stickers. We had Emily's ticket flagged for wheelchair service, which she utilized in both Atlanta and Charlotte. She said that she went to buy a snack and use the restroom while waiting in Atlanta, and as she and John McCane walked away, the waters parted as everyone pulled their feet back and smiled at her, and then when she returned and the seats were all full, someone went leaping out of his seat to offer it to her. How wonderful that there are still gracious people in this world. Amy didn't show up right away at baggage claim, for reasons I still haven't heard, and Emily couldn't get hold of her on the phone, so while we were sitting in the plane in Las Vegas, we got a desperate call from Emily wondering what in the world to do. What a helpless feeling. But once again a gracious person had come forth and was staying with her til Amy showed up, (God bless that woman), and during our second phone call Amy arrived and all was well. Meanwhile, as we sat waiting on the tarmac in Las Vegas, the plane kept shaking so bad I was getting sick. I was trying to figure out what was causing it when the pilot said that we can't take off because of high winds. 84 mph, I think. With lots of debris flying down the runway. So we were 3 hours late leaving, and the only redemptive thing in all this was that Emily was able to reach us with her frantic phone call at baggage claim, which she could not have if we had left on schedule. Check in later for more details than you asked for about the Mennonite minister's moral dilemma, the frantic phone call from home, and more Margaret Mead--this time about the Amish and Mennonites in Florida. Me: Um, a publishing company I guess. Is this a trick question? Emily: It's a sad cow. Me: A. . .sad. . .cow. . .? Em: Yeah. A Moo Depress. Ben: Mom, now you have officially heard everything. Ok, a quick post here while the ringing in my ears dies down and I recover from my afternoon. It was Honor Roll Trip Day, and we took the school kids to Dairy Queen and Aurora Glass, a fascinating place run by the charity St. Vincent de Paul that turns old donated window glass into vases and bowls and suncatchers of many colors and shapes. We all know how I like to re-use what would normally be thrown away, so this was right down my alley. First they break up the windows into little pieces and then pour 600 pounds of broken glass into a big furnace that heats it up to 2300 degrees. They add chemical things ranging from calcium carbonate to copper to color it purple or cobalt blue or green or whatever. A goggled and gloved man opened the door and reached into the glowing interior with a long-handled steel dipper and pulled out a glop of glass that glowed a hot vivid orange. He poured it onto a flat metal surface, where it was squeezed flat and then put into another oven to slowly cool down. It would be green when it cooled, he said. They also demonstrated the glass-blowing they do, basically pouring the glass into a ring, then lifting the ring and shaping the drooping glass with air from a hose. At one point the blower blew up the glass like a balloon and then it shattered and little wispy shards of glass went flying through the air right toward our group of kids, which I don't think was approved by OSHA, but thankfully no one got hurt. Then we headed home, and I had four boys in my car ranging from 6 to 9 years old. Except for opening windows and doors while the car was moving, they behaved ok. The only problem was that they talked in extremely loud voices the whole way down and back. On very boyish subjects. I tried to calm them down a couple of times while I was on the phone but then the decibels flared right up again and I just put a finger in my ear and survived. Kyle: HEY DRIVER DRIVER! GUTS GUTS GUTS!! Trevin: HEY YOU SAID A BAD WORD!!! Kyle: I DID?? WHAT WAS IT?? Trevin: THAT WORD YOU SAID! Kyle: THAT'S NOT A BAD WORD. HEY DRIVER DRIVER! BOOGER BOOGER BOOGER!! Josh: HEY I'M HOT BACK HERE. Trevin: HEY I HAD THIS DREAM ONE TIME AND IT WAS SO DUMB I'M EMBARRASSED TO SAY IT! I HAD THIS DREAM THAT STEVE NASH CAME TO MY HOUSE!!! AND DID YOU KNOW THAT STEVE NASH PLAYED FOR THE ARIZONA CACTUSES AND THEY WERE LIKE THE CHAMPIONS FOR SIX YEARS AND ONE TIME THEY PLAYED THE TRAILBLAZERS AND HE HAD THIS SHOT RIGHT AT THE BUZZER! Trevin: NO WE HAVE A MOVIE. SHALL I TELL YOU A JOKE? ONE TIME THERE WAS THIS AIRPLANE. . .
Kyle: AND IT WAS FULL OF BOOGERS HA HA HA!!! Ok, so I didn't get the sports stuff right but the rest is pretty much verbatim. And I don't think I need a Quote of the Day after all that. . . .is about snow, memories, blizzards, Prune Loaf--things like that. I became enamored with Craigslist when we were shopping for living room furniture. It's a website broken down into lots of localized spinoffs where you can advertise almost anything for sale, ask for things you need, and lots more. It's not nearly as complicated as Ebay and much better for big things like couches that you can't ship in the mail. Recently Emily wanted a file cabinet to organize her multitude of notebooks, so I placed a wanted ad on Craigslist and got a reply from a used-office-furniture place in Eugene. We went in last week and got a nice cheap black 4-drawer file cabinet, which Emily promptly decorated with pink painted polka dots when we got home. And then we stowed it under her loft bed and she has been happily sorting and filing. While I was shopping for the file cabinet I came across a "wanted" ad in which this very pregnant woman was asking for old cotton sheets and things. She wanted to use cloth diapers for her baby but couldn't afford them, and hoped to make her own. Well, I had some still-good diapers I used for cleaning rags, and I knew someone had given Aunt Susie three packs of new ones for some unknown reason (Susie is about 70 years old). So I scraped these together and mailed them to the lady and my frugal old-fashioned soul felt very satisfied. Imagine, a modern young mom wanting cloth diapers! "New church in need---We are in need of a good sound system, lighting, covered trailor, espresso machine, percussion equipment and variouse musical instruments as well. We are rally in need of donations at this poiny or some very generous offers as we are just starting out pioneering the GreenHouse church in Eugene." If you read my last column you know that my SIL Lois arranged for a quilting class for herself, me, Bonnie, and Rosie for our Christmas present. So, twice now, the four of us have gathered at Thimbles & Threads in Junction City, a colorful feminine store that used to be Ralph's Pharmacy or something but is now home to fascinating arrays of fabric and yarn, with the words "Cards and Gifts" still visible behind the yellow fabric stapled onto the back wall. The first day, I walked into the classroom in the back, looked around at all the quilt samples on the walls, and realized I was not in Kansas anymore. Which is to say, these bizarre, eye-popping quilts were a long, long, way from Mom's traditional calico Drunkard's Path and Burgoyne Surrounded and Robbing Peter to Pay Paul. We learned basic strip-piecing at the first class. My sisters and I remember hours and hours spent marking hundreds of squares or triangles with a cardboard template and a pen on Mom's fabric, then cutting them out with scissors. With strip-piecing, in great contrast, you take a pizza-cutter-type tool and cut a bunch of long strips the width of the square you want--say 3 inches--and then you sew the strips together, side by side, and then you cut them the other way into 3" strips and there you have a bunch of squares cut out and already sewed together. This of course expands into hundreds of variations and applications, and yesterday as I sat in class I suddenly picked up on the great truth of quilting--there's always more to learn; there are always more patterns to try; there are always more colors and fabrics and books you just have to have. All of which explains why Mom had rooms full of fabric and notebooks full of ideas, yet never seemed to reach the end of her curiosity and coveting after more. We learn a new technique, then make three or four different blocks using it. We'll have enough blocks for a big quilt if we do all the homework, we were told. Instead, I'm trying to do two twin-sized quilts, for Ben and Steven. I started with a large-print base fabric--again, this was nothing like Mom ever did--choosing a beautiful tan with clusters of African-safari animals all over it for Steven. So much of this is all new to me, but it's amazing what is instinctive. Once I have the strips cut, it all comes back--this side against this one, quarter-inch seam, this piece goes on next. The teacher says things to me like, "Oh, you're doing that already--I guess you jumped ahead of me," and "I want to teach you a little trick with these Log Cabins--Oh! I guess you already figured it out yourself," which shows, I think, that Mom taught me more than probably she or I ever realized. I don't know where I'll go with quilt-making when the class is over. I could really get into some of these modern art quilts, yet I'm old-fashioned enough that I'd much rather cut up scraps from the attic and sew them together than buy $10-a-yard fabric and whack it to pieces. After my last column, an editor at Harvest House Publishers here in Eugene told me to make sure I keep a journal of all this, that there's a book in it somewhere. I don't know about a book, but I have a growing pile of beautiful quilt blocks I put together all by myself, and I know there's a real quilt in there, and that is a very good feeling. "It seems like an unethical shortcut!" Recently a young woman wrote to me wanting some advice. She is dating this guy who is nice and all, but he is not a reader. She's not into a career, but she feels called to be a writer, and she was wondering how this all fits together for an Anabaptist woman considering both writing and marriage. One of the first things I appreciated about Paul when we were dating was that I could use big words and he wasn't intimidated. Also, right from the start he saw my writing as a calling, even more than I did at times. While he still wishes I wouldn't push deadlines like I do, he is very patient when everything gets put on hold the last two days of the month. And he does not feel competitive when I succeed in areas where he doesn't. So I told the young lady that this is the sort of thing she needs to look for, and if her guy shows signs of belittling her interests or being patronizing, those are red flags. Jenny: BEN!! Get my horse out of your armpit! Ben: (playing with Jenny's precious stick horse)It's my crutch! Me: (Sigh) Only in this house. . .